It is the dream of every author to become a "brand name" -- to have his or her name above the title of the book. The author's name is thus automatically associated with a successful book and is used to promote the next book. It is not easy for any author to accomplish this, but it is easier for those who write fiction than for those of us who write nonfiction, particularly in the world of children's literature. Perhaps part of the problem comes from the way books are catalogued in the library. Fiction authors are shelved alphabetically by the authors' last names. Nonfiction books are catalogued and shelved by subject area, so the reading public doesn't need to notice a nonfiction author the same way they remember the author of a story. I've been trying to change that awareness with these posts by shining a spotlight (flashlight?) on children's nonfiction authors who are well-recognized by award committees, but may be unknown to teachers and parents. We are like professors-at-large for children. We are passionate about our disciplines and we know how to write "child" so our passions are contagious to our readers. Let me give you an example of a nonfiction author you need to know about. 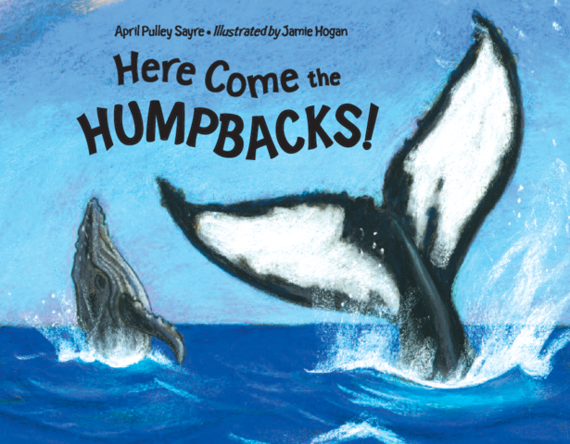 Here Come the HUMPBACKS!, with softly luminous pastel and charcoal illustrations by Jamie Hogan, tells the story of a newborn calf and his mother and their migration from the balmy ocean of the Caribbean to the cold, fish-filled waters off the Maine coast. 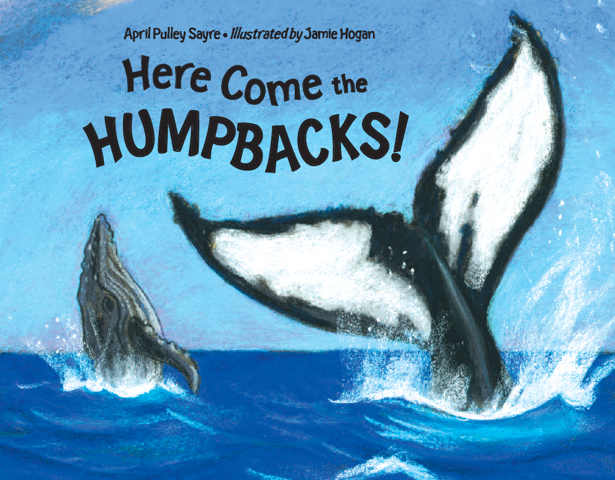 Did you know that humpbacks "roll," and "smack," and "blow." When the blowhole meets air there is "Whiss, snort." Makes you want to go whale watching. 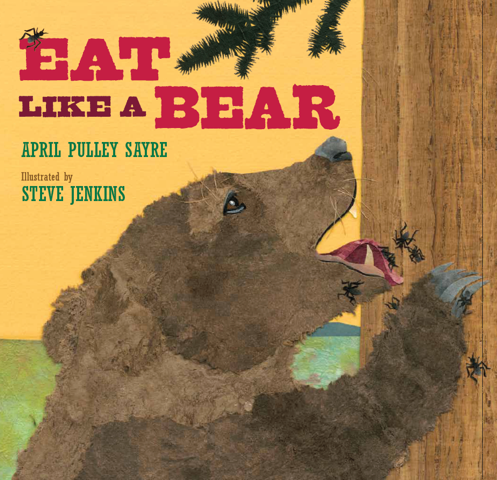 Eat Like a Bear, illustrated by Steve Jenkins (an author/illustrator I'll be talking about next) that is an ode to the voracious and eclectic appetite of the brown bear. "Can you eat like a bear? Awake in April. Find food. But where?" Did you know that this bear's diet includes horsetails, frozen dead bison, parsnip stems, ants, fresh trout, roots, ground squirrel, cutworm moths and (finally a yum!) blueberries? Sayre picked up her own camera to illustrate Let's go NUTS! Seeds We Eat. The brevity of language combined with the stunning photographs can't help but generate an enthusiastic cheer: "Peanut, pine nut. Go, nuts, go! /Chew cashew -- or pistachio!" "It is not half so important to know as to feel. If facts are the seeds that later produce knowledge and wisdom, then the emotions and the impressions of the senses are the fertile soil in which the seeds must grow. The years of early childhood are the time to prepare the soil. Once the emotions have been aroused -- a sense of the beautiful, the excitement of the new and unknown, a feeling of sympathy, pity, admiration, or love -- then we wish for knowledge about the object of our emotional response. Once found, it has lasting meaning. It is more important to pave the way for the child to want to know than to put him on a diet of facts he is not ready to assimilate." True to Rachel Carson's message, April Pulley Sayre doesn't just arouse feelings for her subject matter. She assumes she has generated a motivation to learn more so she closes the deal with succinctly and wittily written information at the back of each book. 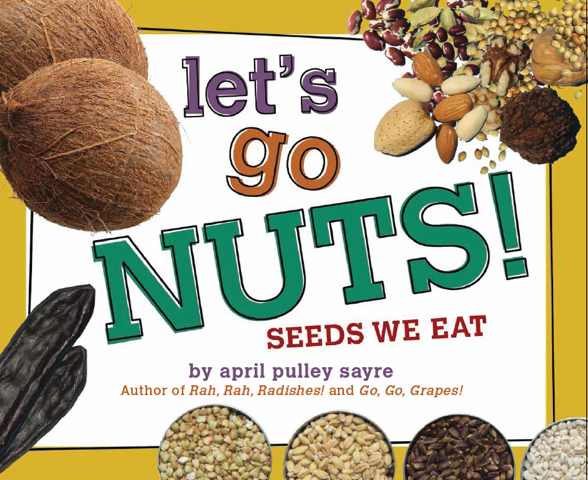 What fun to read "A Few More Handfuls: The Scoop on Seeds!" "Meet the Bears" and understand what it means to be an omnivore, and why we want bears to keep eating naturally and not discover "people" food in garbage cans and knapsacks. At the back of Here Come the HUMPBACKS! we learn about these magnificent animals' incredible migrations and how they are studied by scientists. 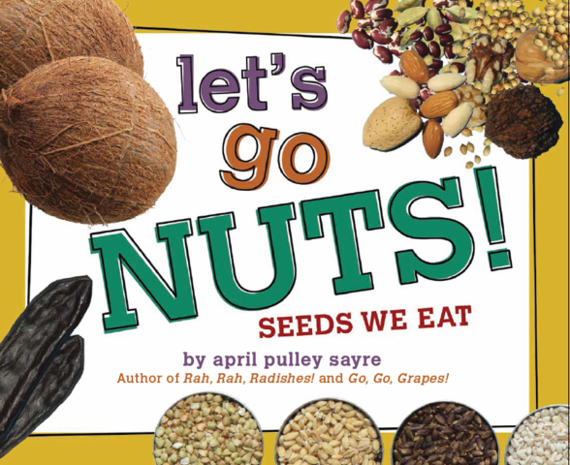 You can't go wrong with any book by April Pulley Sayre. And, if you want to know about more nonfiction authors of her caliber, visit our website: www.inkthinktank.com. It's time you knew our names.